As Cubbington’s ancient Wild Pear tree comes into bloom this chilly wet springtime – possibly its last as it stands on the track of HS2 – the results of the European Tree of the Year competition were announced on 20th April. After its win for England last year, the Cubbington Pear achieved a respectable 8th place out of 15 countries, gaining 7858 votes, beating our near neighbours in Europe [Germany, France, Belgium] by a significant margin. East European countries, instigators of the competition promoting the preservation of ancient trees, galloped away and Hungary won with 72,653 votes. 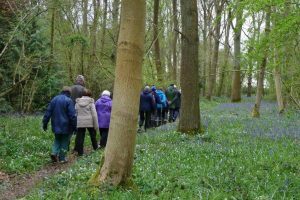 One of the Action Group’s guided walks in the wood among bluebells and anemones, April 2016 (Photo by Frances Wilmot). The Cubbington Pear has become a national icon in the campaigns to save our dwindling ancient woodlands from destruction by the high speed railway. By summer 2015, all attempts to save the Cubbington Pear and nearby ancient woodland had come to nothing: a Tree Preservation Order, a proposal to HS2 Ltd for a bored tunnel under the tree and wood, and petitions by three Parish Councils, Cubbington and Offchurch Action Groups and individuals to the House of Commons Select Committee. Cubbington Parish Council has just submitted a petition to the House of Lords Select Committee, concentrating on the issues of South Cubbington Wood, the pear tree and the impact of construction traffic. This year may be the last chance to see the Cubbington Pear in bloom and the magical carpets of bluebells and anemones in the wood. The Action Group will lead easy two mile walks on Monday May 2nd at 10.30 am [contact 336838] and Tuesday May 10th at 10.30 am [contact 425283], starting outside Cubbington’s King’s Head on Church Hill, lasting about an hour and half. Donations welcomed. Boots or wellingtons are essential in the muddy woodland. HS2 threatened Cubbington Pear in tree of the year final.